Achsah Marie Smith whose siblings are enrolled here. Text: Eva Haight taught this term from 27 APR 1891 to 22 JUL 1891. Mary Wilson age 10 in class, but can't determine which one in database is her. More than one of that name and age. Also Charles Ferman unidentified. Participants: The following individuals are linked to this event: Ada B. Smith (Student); Nellie A. Smith (Student); Addie Tears (Student); Katherine Wood (Student); Amanda Updyke (Student); Lelia Marie Wood (Student); Iva B. York (Student); Charlotte May Walker (Student); Nina Gladys York (Student); Nettie Ide (Student); Katherine A. Richmond (Student); Cora Bell Squires (Student); Olin Fritz Squires (Student); Ward Ide (Student); Fred Smith (Student); Arthur J. Dann (Student); Herman Camp Tears (Student); Ross C. Smith (Student); Walter A. Updyke (Student); Anson Updyke (Student); Dana Smith (Student); Earl A. Welch (Student); Carlton W. Richmond (Student); Eva May Haight (teacher). Text: J. M. Marsh taught this winter term at Elk Run School 07 DEC 1891 to 10 MAR 1892. Mary Wilson not identified. Participants: The following individuals are linked to this event: Earl A. Welch (Student); Leland A. Welch (Student); Arthur J. Dann (Student); Leon E. Welch (Student); Walter Obadiah Smith (Student); Olin Fritz Squires (Student); Nellie A. Smith (Student); Elizabeth L. Robbins (Student); Cora Bell Squires (Student); Ross C. Smith (Student); Fred Smith (Student); Raymond I. Smith (Student); Lelia Marie Wood (Student); Katherine Wood (Student); Herman Camp Tears (Student); Ernest L. Wood (Student); Oscar W. Tears (Student); Foster Updyke (Student); Ward Ide (Student); Charles H. Ide (Student); Nettie Ide (Student); Meritt B. Edgeton (Student); Addie Tears (Student); J. M. Marsh* (teacher). Text: Bertha Welch taught the summer term at Elk Run from 02 MAY 1892 to 03 AUG 1892. Mary Wilson not identified. 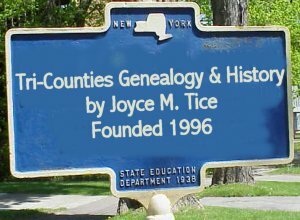 She had 28 students ranging in age from 5 to 14. Her text books were Franklin Readers, Warrens's Speller, Swinton's Geography, Robinson's Arithmetic, Spencerian Copy Books [handwriting], Smith's Physiology, Reed & Kellogg's Grammar. Participants: The following individuals are linked to this event: Cora Bell Squires (Student); Katherine Wood (Student); Ina Mae Richmond (Student); Effie A. Styres (Student); Lelia Marie Wood (Student); Katherine A. Richmond (Student); Nina Gladys York (Student); Nellie M. Hart (Student); Elizabeth L. Robbins (Student); Nettie Ide (Student); Iva B. York (Student); Arthur J. Dann (Student); Amanda Updyke (Student); Walter A. Updyke (Student); Ward Ide (Student); Hosmer P. Leiby (Student); Leland A. Welch (Student); Jennie Leiby (Student); Ross C. Smith (Student); Celia Leiby (Student); Dana Smith (Student); Nellie A. Smith (Student); Olin Fritz Squires (Student); Carlton W. Richmond (Student); Earl A. Welch (Student); Herman Camp Tears (Student); Fred Smith (Student); Bertha Welch (teacher). Text: George Wells Burley graduated from Mansfield Normal School in 1892. He taught at Elk Run for the term 19 DEC 1892 to 13 MAR 1893. He was paid $27.00 per month. He was also reimbursed for purchases of: 3 erasers 25c, wash dish 25c, dipper 5c, comb 5c, crayons 25c total 97 cents. Participants: The following individuals are linked to this event: Herman Camp Tears (Student); Amanda Updyke (Student); Addie Tears (Student); Cora Bell Squires (Student); Olin Fritz Squires (Student); Ross C. Smith (Student); Walter Obadiah Smith (Student); Anson Updyke (Student); Foster Updyke (Student); Katherine Wood (Student); Lelia Marie Wood (Student); Ernest L. Wood (Student); Leland A. Welch (Student); Leon E. Welch (Student); Walter A. Updyke (Student); Earl A. Welch (Student); Raymond I. Smith (Student); Fred Smith (Student); Nellie Elizabeth Smith (Student); Meritt B. Edgeton (Student); Nellie M. Hart (Student); Arthur J. Dann (Student); Charles Smith (Student); Florence Alta Richmond (Student); Louis Northrup Smith Dr. (Student); Charles H. Ide (Student); Nettie Ide (Student); Mary Updyke (Student); Ada B. Smith (Student); Dana Smith (Student); Jennie Leiby (Student); Carl Gilbert McConnell (Student); Celia Leiby (Student); Hosmer P. Leiby (Student); Ward Ide (Student); George Wells Burley (teacher). 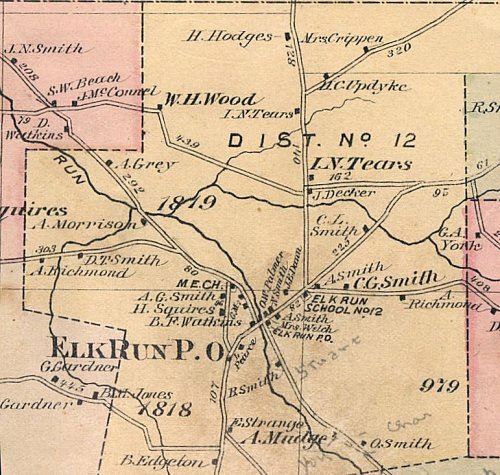 Text: Nancy "Nana" Shepard taught Elk Run School for the term 04 SEP 1893 to 13 APR 1894. She attended Institue and was reimbursed $6.75 for that. Nana no doubt boarded with her sister Charlotte who lived next door to school. Charlotte's son, Nana's nephew, Glenn Smith, was in the class. Earl Hulslander of Nebraska in class for the first month - probably staying with his grandmother Eunice SQUIRES [Hulslander Edgeton]. Participants: The following individuals are linked to this event: Amanda Updyke (Student); Helen B. Updyke (Student); Herman Camp Tears (Student); Anson Updyke (Student); Olin Fritz Squires (Student); Earl A. Welch (Student); Walter A. Updyke (Student); Katherine Wood (Student); Lelia Marie Wood (Student); Ernest L. Wood (Student); Cora Bell Squires (Student); Leland A. Welch (Student); Ross C. Smith (Student); Walter Obadiah Smith (Student); Nettie Ide (Student); Ward Ide (Student); Meritt B. Edgeton (Student); Ada B. Smith (Student); Arthur J. Dann (Student); Dana Smith (Student); Nellie A. Smith (Student); Raymond I. Smith (Student); Fred Smith (Student); Glen Irwin Smith (Student); Burke Emmet Garrison (Student); Nancy Ann Shepard (teacher). SCHOOL ATTENDANCE RECORD - 04 SEP 1894 to 02 APR 1895. 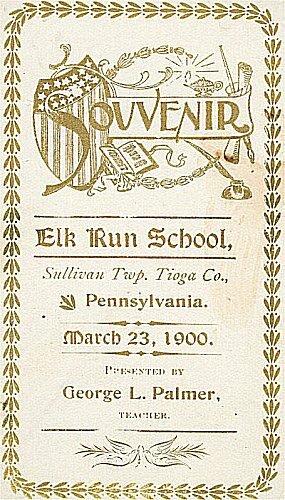 Text: Charles Conley was teacher for the Elk Run School's term of 04 SEP 1894 to 02 APR 1895. Ned Smith, Ron Smith not identified. 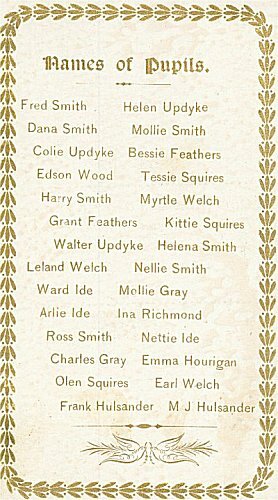 Participants: The following individuals are linked to this event: Mary Updyke (Student); Earl A. Welch (Student); Foster Updyke (Student); Leland A. Welch (Student); Amanda Updyke (Student); Katherine Wood (Student); Ruel Irwin Richmond (Student); Harrison E. Dann (Student); William Richard Hawkins (Student); Herman Camp Tears (Student); Lelia Marie Wood (Student); Olin Fritz Squires (Student); Ward Ide (Student); Carl Gilbert McConnell (Student); Nettie Ide (Student); Florence Alta Richmond (Student); Meritt B. Edgeton (Student); Ina Mae Richmond (Student); Raymond I. Smith (Student); Ross C. Smith (Student); Nellie A. Smith (Student); Arthur J. Dann (Student); Dana Smith (Student).